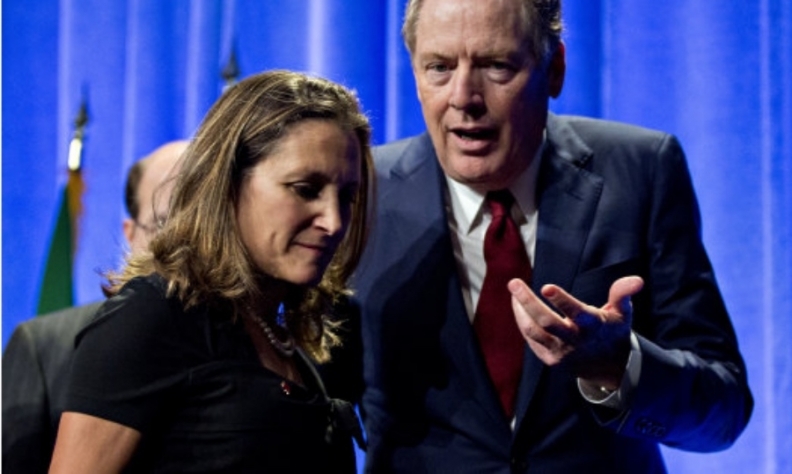 OTTAWA — American trade officials are showing newfound interest in a Canadian proposal for revamping NAFTA's automotive provisions as the U.S. seeks to swiftly conclude renegotiations of the continental free-trade pact. And that's being taken in some quarters as a sign that the U.S. may realize it will have to settle for making only modest progress on a handful of American demands if there's to be any hope of concluding a deal within the next few weeks. At the conclusion of the last round of negotiations in Mexico earlier this month, U.S. Trade Representative Robert Lighthizer said "time is running very short" to get a deal before "political headwinds" — Mexico's presidential election in July, American midterms in November and provincial elections in Ontario and Quebec — start to complicate matters. For the first time, Lighthizer made public his hope of completing a NAFTA deal — including the legally required six-month congressional consultation period and ratification vote — before a new Congress gets sworn in next January. Canadian government officials are privately skeptical that a deal can be concluded at such a breakneck pace, particularly since Mexico's presidential campaign officially kicks off at the end of this month and no candidate can afford to be perceived as conceding anything to U.S. President Donald Trump, who is political kryptonite in that country. They believe the only way it can happen is if the U.S. drops many of its controversial demands and accepts modest changes in just a few key areas — in particular on automobiles, which Canadian officials have believed from the outset would be the key to a successful renegotiation. "I would agree with all of that," he said in an interview. "That was a good meeting. It gave me hope," he said, noting that U.S. trade officials had not accepted an invitation to meet with him during the first six months of the negotiations. "If you look at the fact USTR was willing to receive me in Washington for a real meeting, it is the best signal to me that we could be in a phase where we get over the hump." In the meeting, Volpe said the Americans reiterated their opening demand — that vehicles must have 85 per cent North American content and 50 per cent American content to be eligible for duty-free movement across the three countries, up from the current NAFTA requirement of 62.5 per cent North American content — which has been rejected as a non-starter by Canada, Mexico and the industry. But he said they were also "intellectually curious" about Canada's counter-proposal. Canada has proposed that NAFTA's list of traceable components that go into cars and trucks be updated to include not just things like steel, aluminum and plastics but also intellectual property — like the software behind the computerized parts that are now integral to most vehicles and destined to become even more so as the industry embarks on an era of self-driving automobiles. When Canada first put its proposal on the NAFTA table back in late January, Lighthizer rejected it, predicting it would lead to more Asian content in vehicles — precisely the opposite of what the U.S. was trying to achieve. But Jerry Dias, president of Unifor, the union that represents Canadian auto workers, said his read is that the proposal "wasn't offensive to anybody" and that all three countries could live with it. Nevertheless, he doubted that it provides sufficient basis to strike even a scaled-down deal by next month, unless Canada and Mexico both "capitulate" on other unpalatable U.S. demands. And that, he predicted, is "not going to happen," particularly not with Mexico embarking on its presidential campaign in two weeks. "My guess is this thing isn't going anywhere," Dias said. The U.S. has proposed a number of so-called poison pills that Canada and Mexico have flatly rejected, including: elimination of NAFTA's dispute resolution mechanisms; a sunset clause that would automatically terminate NAFTA unless it was renewed by all three countries every five years; and Buy American provisions to limit the number of American public contracts that could be awarded to Canadian and Mexican companies. The U.S. has also demanded an end to Canada's supply management system, which limits imports on milk, cheese and poultry, and sets minimum prices. Some trade experts suspect the Trudeau government may be willing to accept a small increase in U.S. dairy imports, similar to what was agreed to in the original Trans-Pacific Partnership, before Trump withdrew the U.S. from that trade deal.